That bomb cyclone you’ve surely read about has officially gone off. And the images rolling in are something else. 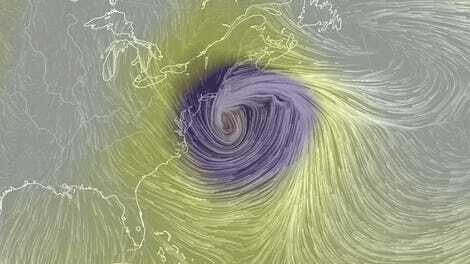 Pressure dropped 54 millibars in 24 hours in the winter storm currently climbing up the eastern seaboard. That’s more than double what’s needed to classify it as a bomb, making it a super bomb (kidding, please don’t repeat that, especially not to a meteorologist). In all seriousness, the impacts are piling up. Hurricane force winds have reached as far north as Cape Cod. Iguanas are turning into iguanicles in South Florida. The lights are starting to flicker out in Massachusetts. Snow is accumulating everywhere from Florida to Maine. This storm has been well forecast, and is playing out as expected. Cold air is waiting in the wings to make this weekend miserable (and potentially deadly) for the eastern U.S. The recently operationalized GOES-16 satellite is returning a wealth of stunning views of a storm that could be writing its way into the record books. That’s why so many meteorologists doing a little happy dance even as they try to forecast a dangerous event. Seriously, this storm is a thing of meteorological beauty and likely inspiring the next generation of meteorologists sitting at home enjoying a snow day. The source of the storm’s power is the huge temperature difference between the warm ocean currents and cold air covering most of the eastern U.S. The process is known as baroclinic instability. Andrea Lang, a meteorologist at the University of Albany, likened it to what would happen if you had a fish tank divided in half with warm water on the bottom and cool water on the top. If you pull out the divider, the dense cold water would immediately drop and the warm water would rise. Baroclinic instability is a common factor in all nor’easters, strong winter storms that impact the East Coast, but this storm will likely go down as one of the most rapidly intensifying on record for the region. 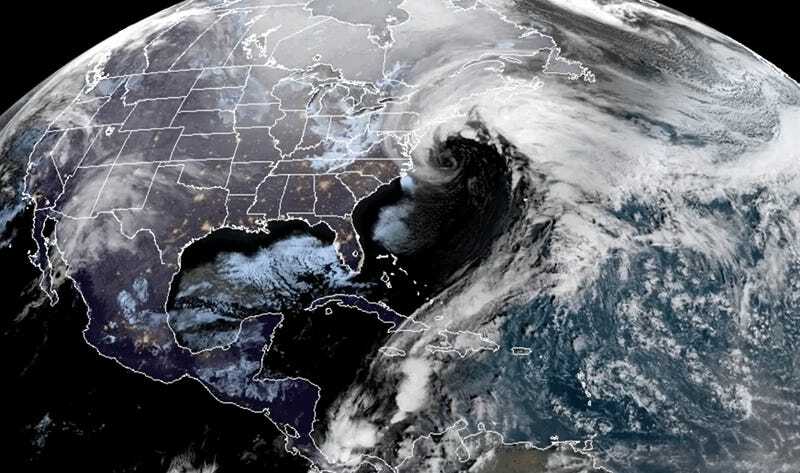 The new GOES-16 satellite is not only helping produce drool-inducing images, but returning data on a major event that will help meteorologists improve forecasts for the next storm, whether its a bomb or a plain ol’ nor’easter.